Join the discussion on our forums! Come discuss Murmuring Elemental over in our dedicated Murmuring Elemental discussion topic. Battlecry: Your next Battlecry this turn triggers twice. This also doesn't stack with Battle Totem in dungeon run mode. Your Battlecry effects still only triggers twice. I'm not surprised, but effects don't stack either with itself or Brann Bronzebeard. This is probably the most meta-defining card for Shaman. It might enable Elemental Shaman to become a thing and it certainly has a spot in Evolve shaman as it seems like it will make Thrall, Deathseer essentially Evolve your board 4x. I'm still not clear (I know I can probably just look it up) as to whether WotOG rotates out with K&C, but if I understand correctly the answer is "not yet" which means you can have a turn with Doppelgangster and Evolve getting a random 3 drop and 5x random 6 drops. That's nuts! Does anyone see the OTK potential? Al Akir, rockbiter weapon, spellstone copy x 3 for 48 damage from an empty board. If you get some help from far sight, you could get 2 rockbiters on Al Akir for 72 damage. That would be an OTK. If you can make a deck that makes it work, more power to you. 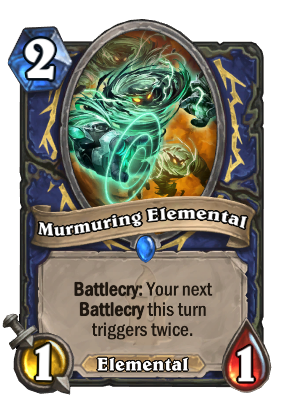 Murmuring Elemental effect is battlecry, why wouldn't it trigger twice? Combining Brann Bronzebeard with Murmuring Elemental does cause the battlecry to trigger twice, but that doesn't actually accomplish anything. We've seen in the past that multiple instances of "X effect triggers twice" don't stack. In the end, Elven Archer's, Mad Bomber's, or C'Thun's battlecry won't trigger more than twice. Yes, effects stacks up like this: Now your Battlecries trigger twice -> Now your Battlecries trigger twice -> Now your Battlecries trigger twice ... keep on as long as you like, but it does not change the fact that at the end "your battlecries trigger twice". Card text doesn't say it DOUBLES triggering battlecry effects. Twice is static. This guy doubles the death knight too. Stick a board on turn 6 with Doppelgangster Evolve. Then on the next turn you first value trade and then Murmuring Elemental + Thrall, Deathseer for three 10 drops and a 6 drop. "Your battlecry triggers twice" effects don't stack. Having multiple copies of Brann Bronzebeard doesn't yield any additional benefit, and triggering this multiple times is similarly an extraneous maneuver. I know. I said I didn't think that this card wouldn't be any different. Just that if it was for some reason, if they did it wrong, it could theoretically lead to an infinite loop condition depending on how they defined the code to handle "next" battlecry. One of the best cards of the new expansion Dragons and Catacombs.